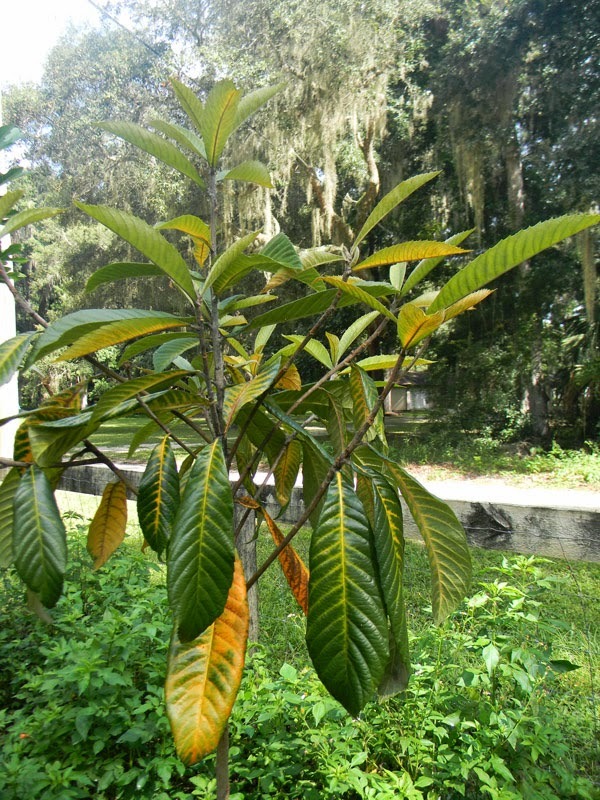 Remember the rare loquat tree I tried to save? Well… it finally gave up. The top started to turn yellow and the leaves began to droop about a month and a half after I attempted bridge grafting the poor thing. Obviously, at this point, the tree was not long for this world. By God’s grace I noticed what was happening before it went too far, so I cut off every stem tip. 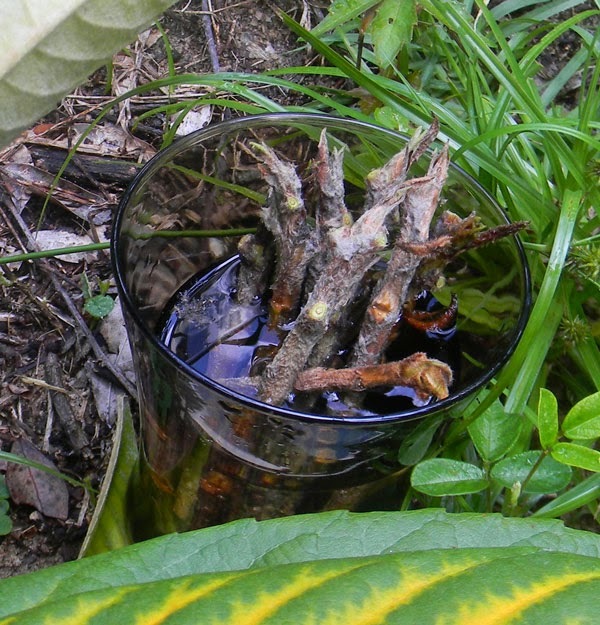 The twigs in the glass of water have had all their leaves removed; the ones in my hand are about to get the same treatment. Those little twigs are ready for a new life on a new host. 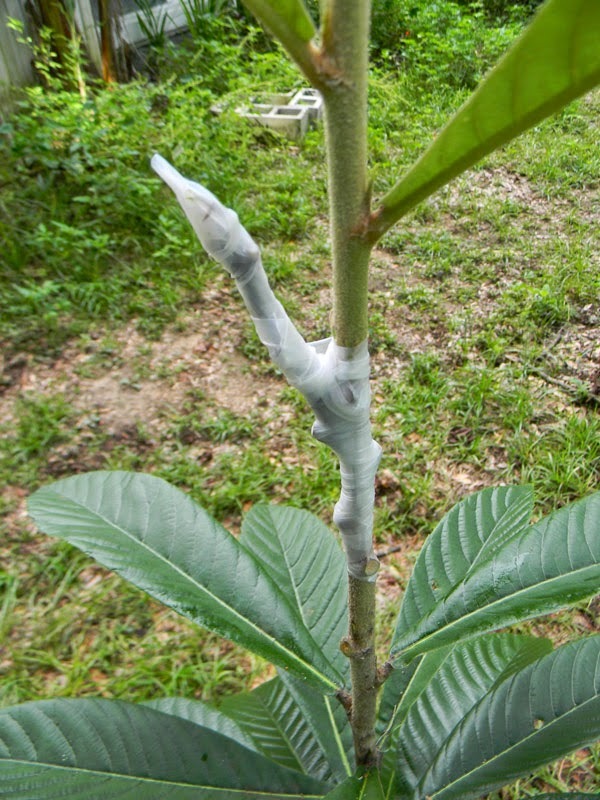 Fortunately, I have lots of seedling loquats planted around the yard – and grafting loquats is easy. 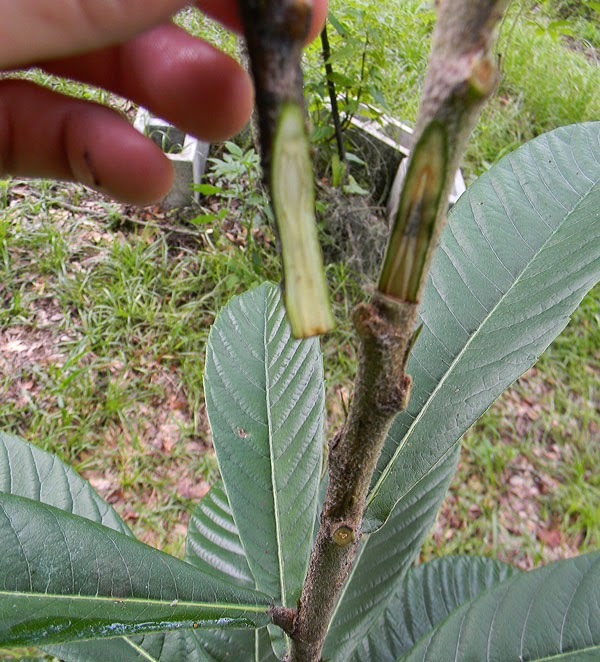 I learned at the Florida Earthskills Gathering earlier this year that one of the easiest ways to graft a loquat tree is to “veneer graft” it. Anyhow, I started grafting this tree by removing a section of leaves from the middle of the trunk. Then I picked out a twig from the donor tree that was close to the same diameter as the seedling tree and used my grafting knife (this really cool Opinel model ) to make matching cuts on the budwood and the trunk. Grafting a loquat is only a little tricky. A good fit is important. You want the bark on the budwood and on the tree to match up well so they can grow together. The layers just beneath the outer bark (the “xylem” and “phloem” – glad you asked!) transfer sap and will heal together as the graft takes. A tight wrap of grafting tape helps (I use this stuff – it’s great ) keep the bark together while preventing the budwood from drying out. I wrap all the way to the top. Since it’s summer and brutally hot, I don’t want to chance the grafts drying out and failing. Once the leaves grow out on the bud and the graft appears to have healed, it’s time to cut the original top of the tree off. Loquat grafting isn’t hard. Knowing it has allowed me to save the genetics of a tree that would have otherwise been lost to my yard. I was worried that the time of year was completely wrong for grafting fruit trees. At least in the case of loquats, I have happily proven my worries unfounded. 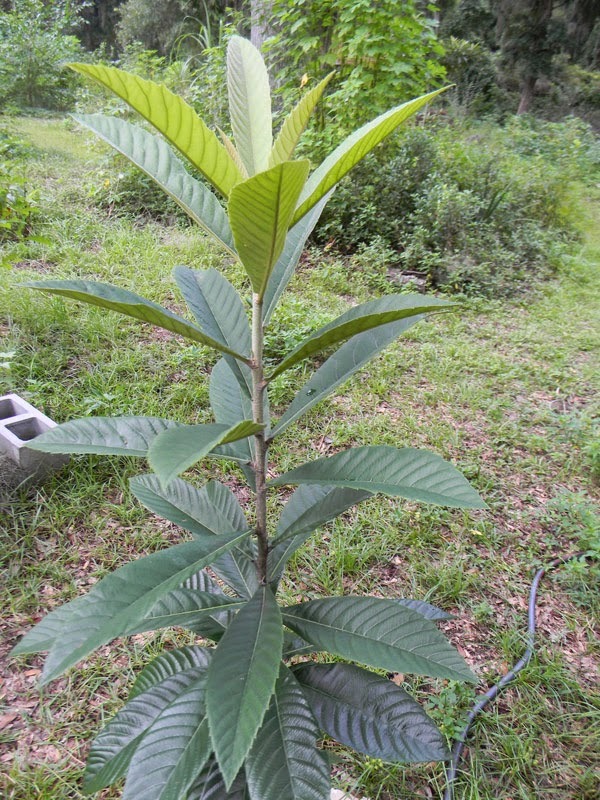 Now grow, loquats, and bring me fruit! Cool, I'm going to try it for making a frankenloquat. 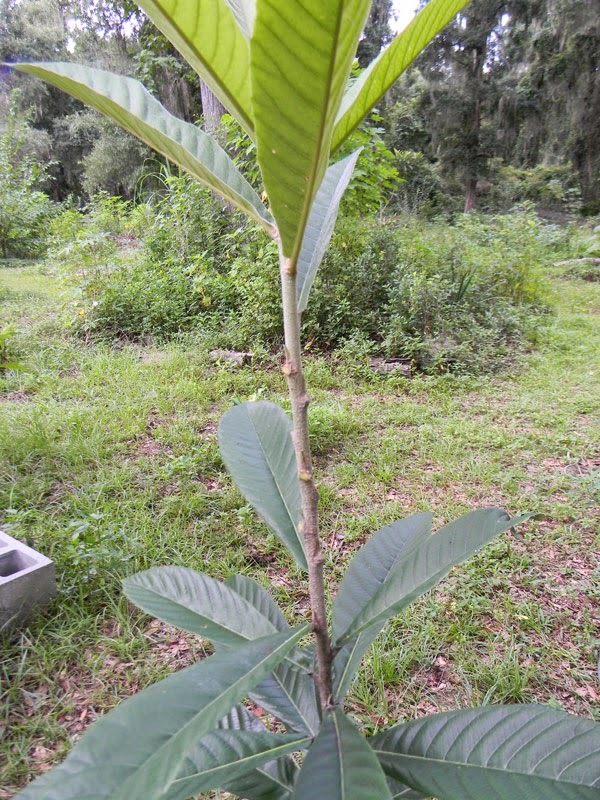 I've been told to graft loquats and evergreens in general, when the host is pushing or growing. With apples, I've found that I can graft almost any time here with a reasonable chance of success. I was told by Oliver, the man (a loquat collector) that taught me grafting, that loquats are a super-easy grafter… basically, he says, you can be a complete novice and whittle the scions poorly and they'll still likely take. I have 2 trees grown from seed and would like to try to get some good grafts. Where would I find any? 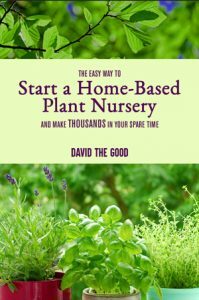 Connect with local gardeners. I joined a few groups on Meetup.com and we traded back and forth. I also made friends with people online and traded scion wood. You can also look around your area for any beautiful trees with lots of fruit, then ask for pieces you can graft onto your own. It’s probably a seedling – wait another year or two, you should have fruit. Mine fruited at 6 years of age. 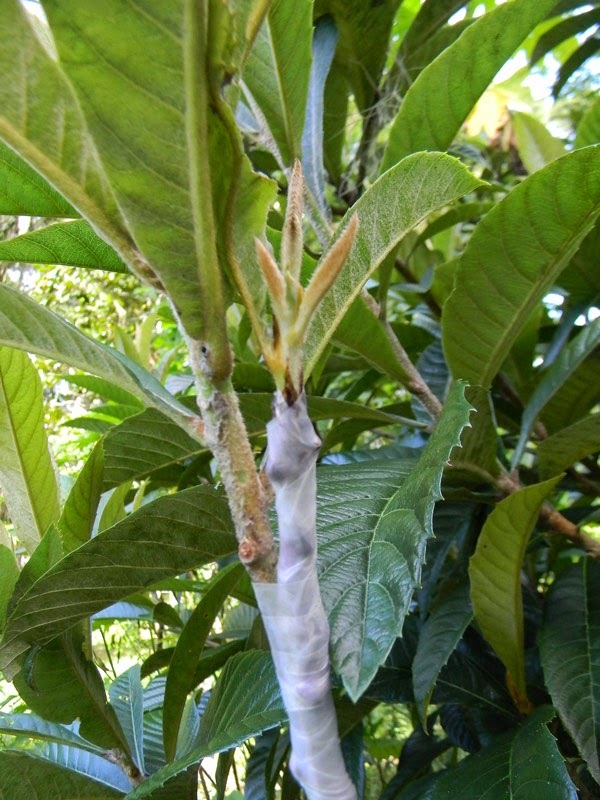 Hi, nice article about loquat grafting. I have a question on what u said there. When the donor branch gros and heals, u said to cut the top of the old tree off. I wonder what happens to the lower branches of the old tree. r they supposed to be left along and grow big? Would this be a problem? Someone gave me a big jim loquat that has just that problem. I wonder if I should cut the lower branch off for this specimen. Thanks. It depends if you want to keep fruit from the original tree or not. If you graft low on the tree, you can let your scion become the new trunk. Higher up, you can just let it be one branch among many. If I had a grafted tree like you have, I would cut all branches below the graft. 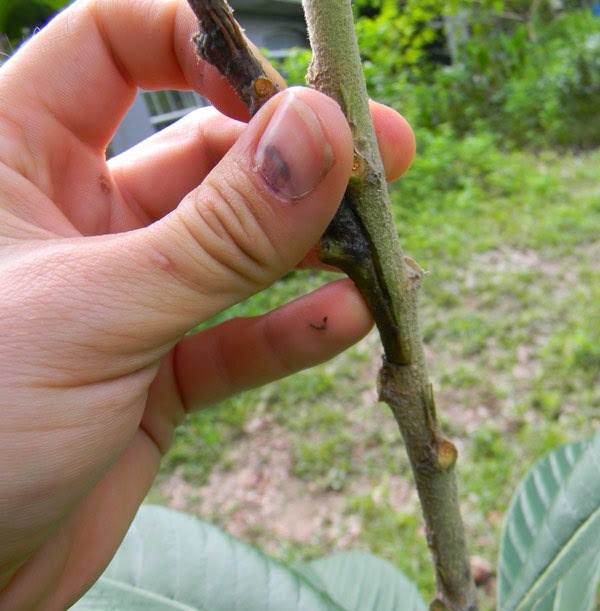 Can you also leave the main trunk above the graft and grow the graft as a side branch? 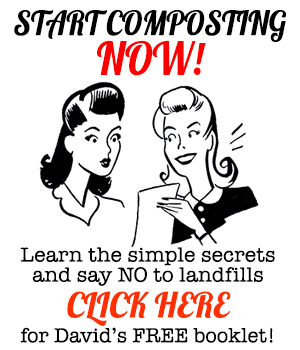 Should you cut less deep into the trunk if you plan to do it this way? Can you cut the angle less steep or do you risk that the graft won’t take then? Yes, you can grow the graft as a side branch. In that case, though, it’s probably a better idea to just go higher up and replace an existing branch. 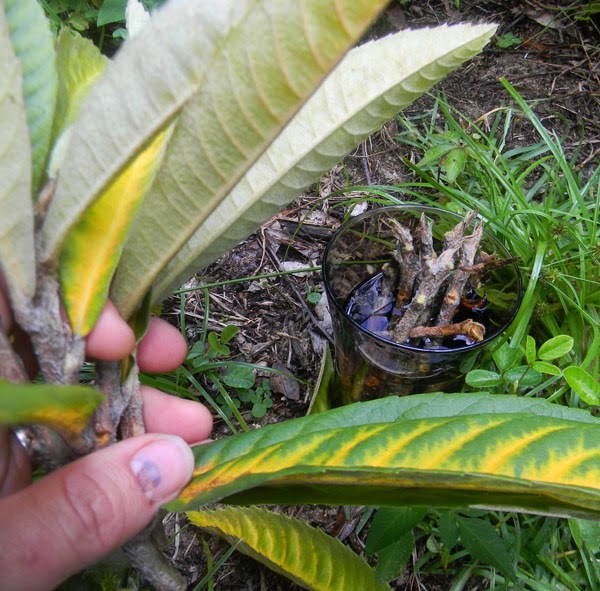 Loquat is very easy to graft. You can experiment with the angles. The important thing is to get the cambium to join up. yeah, that is what I thought. 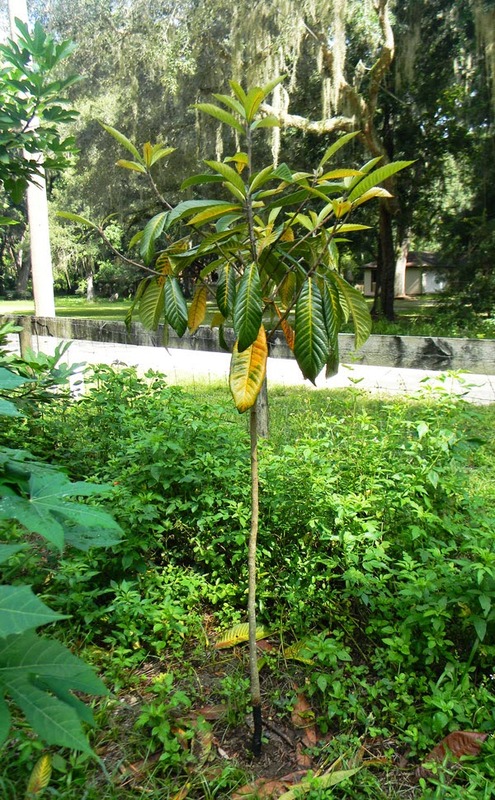 However the reason of grafting a loquat is because the plant from the seed (the rootstock) doesn’t keep the same characteristics of its parents. Grafting solves that problem since the donor is from a reliable tree. I have cut the rootstock branch to be safe. Yes – generally that is the reason you would graft. I have grafted higher up on purpose so I could harvest multiple types of fruit from one tree. In this case, that’s not what you’re looking for. Just get rid of everything that isn’t the Big Jim. David, greetings from Floral City. Turk here. 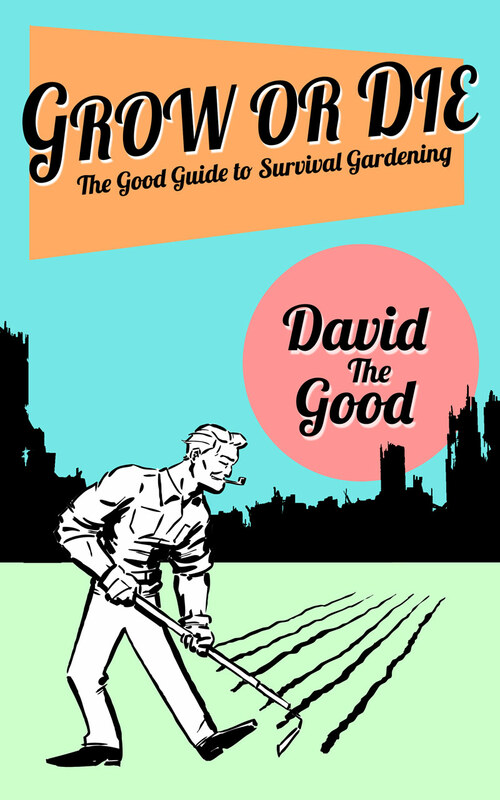 I’ve read myriad articles and watched a plethora of videos, RE: grafting. Some mention that they have been successful cutting scion and grafting simultaneously around about April. What is your respected opinion? Are you familiar w/the method of grafting in this video?